Do your kids help around the house? Willingly?! Or is it a battle zone with lots of shouting, resentment and frustration? I’m a big fan of my kids helping around the house. I want our family to be one where we all contribute & support each other in the day-to-day activities. Firstly they make me feel inadequate that I haven’t got my kids doing all of those things (I know – nothing can ‘make’ me feel anything, but you get my drift!). I’ve struggled with trying to stay connected with my kids whilst getting them to do jobs. I’ve ranged from being shouty & forceful – to giving up & doing everything myself. Neither of them were satisfying or helpful for anyone. 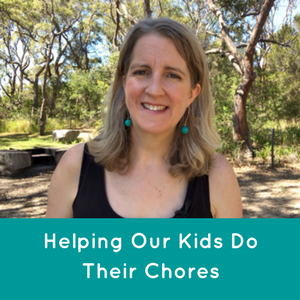 So how can we stay connected, share the load and help our kids to be willing to help around the house? That’s the topic of this week’s video! WANT MORE SUPPORT & GREAT TIPS? If you’d like help with issues your child is experiencing at school, SIGN UP NOW for my FREE Reduce School Stresses with PLAY! 5 days, 5 games, 5 playful ways to help your child navigate common challenges with school.